A quark-free, antiquark-free, gluon-free, Higgs-free, model of particle physics. 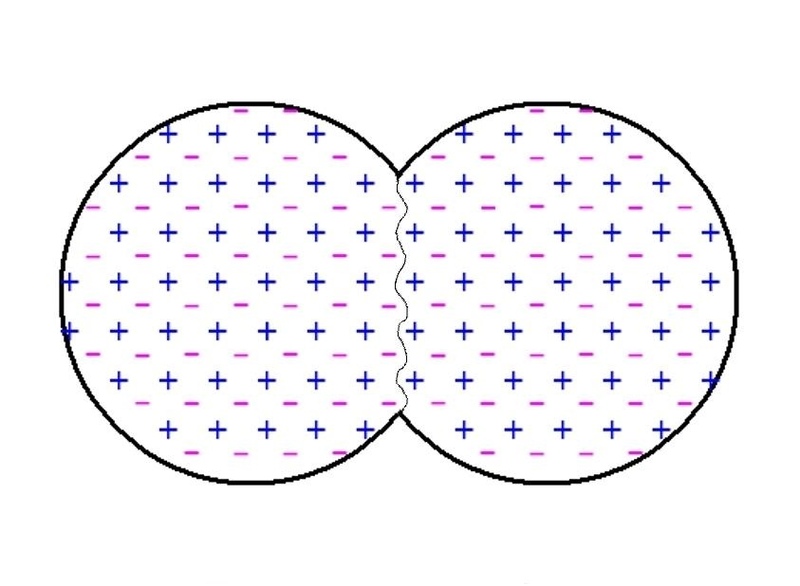 The wisest of the Ancient Greek philosophers realised that ultimately the universe could only be composed of identical indivisible spheres; and Squish Theory extends this idea with the concept of compressible spacebubbles. In a universe composed only of spacebubbles, all mass/energy must be a compression of the spacebubbles, so particles can only be made of squashed spacebubbles which are spinning either clockwise or anticlockwise. It therefore follows that in physics terms, particles can only be composed of collections of positive and negative charges, as in positrons and electrons. The reasoning behind this conclusion is largely philosophical and cosmological, but is not discussed in this paper. Rather what the paper does, is examine the difference in mass between particles of similar size, in order to show that the theory is consistent with existing data; and to determine the binding energies of charges inside particles, and on the surface of particles. It then shows that the values deduced are consistent with the idea that a neutron is a proton with 3 extra charges on its surface; and also that the binding energies of simple atomic nuclei can be predicted on the basis of the interactions between charges on the surface of nucleons. Finally the paper shows how this model can be used to predict the existence of certain observed particles. Of course there is not sufficient accurate data on particle masses, to show conclusively that they must be collections of charges; if there had have been, then clearly somebody would have already noticed the pattern; however the pattern is certainly strong enough to warrant further testing. The major problem for this theory, is that the standard model has taken root, and in these highly religiosised times, physicists have a religious duty to condemn all new ideas as crackpot. However we do not even need to scratch the surface of the standard model to see that it is untenable, as a universe composed of so many ‘elementary’ particles would not merely have required a separate creator, but one of severely impaired intellect, a hypothesis nobody has ever suggested. On top of this, of the major actors in the drama, the dozens of quarks and anti-quarks, none have actually been directly measured for either mass or charge; and even those ‘elementary’ particles which do actually exist, such as muons, are clearly composed of something else otherwise they would not spontaneous disintegrate. In Squish Theory there is no such problem, as all particles are merely composed of pairs of charges, which can unravel in the same way as electron/positron pairs; so the only unbreakable particles must be electrons and positrons, which can only unravel if they meet their Nemesis. Here is a diagram to illustrate the general idea that a particle such as a proton is made from a lattice of positive and negative charges; with an amount of binding energy resulting from the fact that unlike charges are always closer than like charges. It is not intended to convey the detailed structure; as even if this was known it would be hard to illustrate, since the charges are clearly not arranged in skins like an onion, but rather in a complex 3D lattice. Sigma-plus with a mass 2327.53 times that of an electron. Sigma-neutral with a mass 2333.93 times that of an electron. Sigma-minus with a mass 2343.35 times that of an electron. Each of these particles must be made of a certain number of charges, but I cannot calculate those numbers exactly. What can be calculated is the difference in the number of charges. The difference in mass between the sigma-plus and the sigma-neutral, is 6.4 electron-masses. This must be accounted for by an odd number of charges. If the number was 7, then the mass per added-charge would be .91, if there were 9 extra charges the figure would be .71, and with 11 it would be .58. If we assume that all particles are roughly spherical balls of charge, then the mass per added-charge ought to be about the same in all cases where particles contain thousands of charges. So now lets consider the difference between the sigma-neutral and the sigma-minus. The mass difference this time is 9.42 electron-masses. If the number of added charges was 11, then the mass per added-charge would be .86, with 13 it would be .72, and with 15 it would be .63. Clearly the only values that correspond are .71 and .72. We would not expect the values to be identical, as ultimately they depend on the exact arrangement of charges inside the particles, but we might expect the values to be closer than those. However the masses of the sigma particles are not known exactly, and if we include this uncertainty in the calculations we end up with a range of .69 to .73 in the first case, and .716 to .73 in the second, which suggests that in both cases the mass per added-charge is around .72. The Xi-neutral and the Xi-minus, have a mass difference of about 13.4 electron-masses; so assuming the Xi-minus contains 19 extra charges, we get a range of .68 to .73. The meson-plus and the meson-neutral, have a mass difference of about 9.3 electron-masses; so assuming the meson-plus contains 13 extra charges, we get a range of .67 to .76. The D-meson-plus and the D-meson-neutral, have a mass difference of about 6.44 electron-masses; so assuming the D-meson-plus contains 9 extra charges, we get a range of .65 to .78. In each of the above three cases, for the range to have included .72 by chance would happen a bit more than half the time, but the fact that .72 is in each case somewhere near the central value, provides some reassurance. Those are the only large particles whose masses are known with sufficient accuracy that they could have contradicted Squish Theory. There are however some smaller particles which are not quite so obliging. In the case of smaller particles, we would expect the average mass per charge to be more; because a larger fraction of their charges would be on the surface, and surface charges would have a higher mass because there are no opposite charges above them overlapping their electric fields. In fact a useful rule of thumb, is to assume that each surface charge has a mass of .8, whilst each fully surrounded charge has a mass of .7. If we apply this rule to the larger particles above, where we would expect adding 10 extra charges to increase the number of surface charges by about 2 or 3, we do in fact get the answers .72 or .73 electron-masses per added-charge. In the case of pions, with masses of around 270 times that of an electron, the difference between the pion-plus and the pion-neutral is very close to 9 electron-masses. So we must assume that involves 13 extra charges, giving a mass per added-charge of only .69. In kaons with masses of around 970 times that of an electron, the difference between the kaon-plus and the kaon-neutral is around 7.7 electron-masses. So we must assume that involves 11 extra charges, which gives a mass per added-charge range of .69 to .71. These lower values are not particularly convenient, but could perhaps be explained away by saying that although the pion-plus contains 13 extra charges, its structure is such that it still contains the same number of surface charges as the pion-neutral. Of course the situation is not really that simple, as one cannot actually build a sphere out of the 350 or so charges that make up pions; and even if one could, the steeper curvature of the smaller sphere would leave the surface charges more exposed, thus increasing their mass. 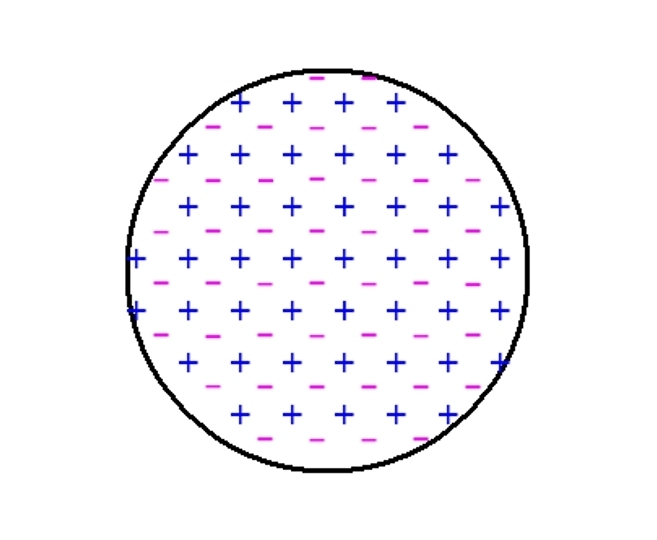 To provide a proper theory, we would need to know the exact positions of the 350 or so charges inside the particles; however the basic principle that the larger pion-plus has a much more compact structure than the smaller pion-neutral, is certainly supported by the evidence that its average lifetime is a billion times greater. We could try to use a similar argument for the kaons, however it should also be noted that having a net charge would be expected to slightly increase the mass of a particle. If we were to assume a value of around .05 of an electron-mass to cover this, and then adjust the calculations accordingly, it would push the mass per added-charge for kaons up to a middle value of .705, as well as making both the sigma middle values around .715. Due to the stable nature of the proton, and the less stable nature of the neutron, in Squish Theory it is clear that a neutron must be a proton with 3 extra charges on its surface. Since ordinary surface charges are estimated (as calculated above) to have a binding energy of .2 electron-masses; then the more exposed nature of the 3 extra charges, means that they might be expected to have a binding energy of only around .1. However this is partly offset by the fact that the charges underneath the extra 3, would have their binding energies increased from .2 up to perhaps somewhere around .25. So all things considered, a binding energy of about .15 per added charge for each of the extra 3 sounds reasonable. .85 × 3 = 2.55 electron-masses, which is the roughly the difference in mass between a proton and a neutron. The neutron mass is quite a stringent test of squish theory, because if the difference in mass was much less than 2.4, then it would be impossible to produce a model of the neutron at all. On the other hand, if the mass difference was much more than 2.7, then we would need to assume that the neutron contained 5 more charges than a proton, which would make no sense unless the mass difference was over 4 electron-masses. The diagram below is intended to show that the strong nuclear force is caused by the interaction of charges on the surfaces of nucleons; and also that the way these surface charges fit together is equivalent to how charges fit together inside nucleons. In order to calculate, we need to make some assumptions. The first is that when nucleons stick to each other, they fit together in a similar way to the layers in a particle. This is what logically ought to happen, and it means we can do our calculations by using the rule of thumb that whilst each surface charge weighs .8 of an electron-mass, each fully enclosed charge only weighs .7 of an electron-mass. So when two nucleons stick together, each pair of charges which overlap, will release .2 of an electron-mass of energy. During the formation of a deuterium nucleus, a proton and a neutron stick together. The energy released is equal to about 4.4 electron masses, which suggests that about 22 pairs of surface charges overlap; implying that the nucleons flatten slightly from the spherical, such that about 1/40 of their surface area makes contact. The conclusion that nucleons are flexible, is also necessary to make sense of the tritium nucleus, where one proton and two neutrons are stuck together. We would expect the energy released this time to be around 3 times as great, as there are now 3 points of contact; but the energy released per contact point also increases, from 4.4 to 5.6 electron-masses. This implies that the two points of contact on each nucleon are somehow working together to further distort their shapes from the spherical. A standard helium nucleus, or alpha particle, is made from two protons and two neutrons. We only need to try sticking 4 balls together, to realise why an alpha particle, with 6 points of contact, ought to be a very stable structure. Since nucleons are flexible, we can assume that at the heart of an alpha particle, there is almost continuous surface contact between the nucleons. This would suggest that about 1/6 of the surface area of each nucleon is in contact with other nucleons. Assuming that a proton is made from about 2501 charges, the total surface area should contain around 810 charges, and 1/6 of that is 135. So the formation of an alpha particle should involve around 135 surface charges on each of the 4 nucleons becoming fully enclosed, which would yield 4 × 135 × .1 = 54 electron-masses of energy. Which is unnecessarily close to the measured value of 55 electron-masses. That was only a rough calculation, based on assumptions which may not be very accurate, but it is still enough to show that Squish Theory’s explanation of the strong nuclear force does predict values similar to those measured in experiments. If we assume that the average mass per charge in a proton, is around .74 of an electron-mass, then a proton must contain about 2500 charges. A sphere with a diameter of 17 charges, would have a volume of 2572 charges. Given that a perfect sphere cannot be formed from this number of charges, it is reasonable to assume that a particle with a diameter of 17 charges, would contain no more than around 2500 charges. We can then assume that there might be other particles whose mass can be predicted using the formula: n³ /17³ ´ the mass of the proton, where n is an integer. For instance if we put n=9, we generate a mass of 140 MeV, which is almost exactly the mass of the Pion. It is certainly surprising that the formula would work so well for a particle only 1/7 the mass of the proton, as there are two obvious reasons for a discrepancy. Firstly the Pion would have a higher fraction of its charges on the surface, and since surface charges are heavier, this would tend to make the Pion mass higher than the value generated by the formula. Secondly the difficulty in creating a perfect sphere out of only around 400 charges, would imply a reduction in charge numbers, which would tend to make the Pion mass lower than the value generated by the formula. Since these two factors act to cancel each other out, it is still possible that the Pion could have a diameter of 9 charges. The table shows all known particles with masses up to twice that of a proton; there are however many heavier particles that are not shown. Looking at the figures on the positive side, there are six successive values from n=16 to n=21, where there is a particle at a mass close to that predicted by the formula. Also in each of the 4 cases with masses higher than the proton, the actual particle has a mass slightly above the value of the prediction. Furthermore the two particles in this range (excluding the proton and neutron) with the longest lifespans, do conform to the formula. On the negative side, there are plenty of known particles which the formula does nothing to predict. In order to try to plug the gaps, I guessed that in addition to being near spherical, particles might be spheroids; that is slightly grapefruit-shaped or lemon-shaped. To test this, instead of using n³ in the formula, I used n² (n+1) and n² (n– 1). Despite this variation producing twice as many values, I only got one hit: 19² ´ 20 generates a value of 1379, which is close to the mass of the Sigma. For want of a better idea, I then tried using half values: (n+½)³ . Again I only got a single hit: 17.5³ generates a value of 1024, which is close to the Phi Meson mass. So basically these variations were worse than useless. The other major problem with the formula, is that it does work with masses that are substantially lower or higher than the proton; but then again it would not necessarily have been expected to. It is perhaps possible that the Pion could have a diameter of 9 charges; and that the Muon could be an even worse attempt at a sphere, with a diameter of 8 charges; and that there are other particles waiting to be discovered to fill the gaps. But it is more likely, since nature always seems to hold surprises, that there is plenty going on that I cannot envisage. If the formula n³ /17³ ´ the mass of the proton, had merely been extracted mathematically, then it might not have been considered to be too significant. However since it follows directly from the Squish Theory model, and ties in with the other calculations in the paper, it would be a very strange universe if none of that had any significance. Of course there is plenty missing from the model: there is no explanation as to how the charges are arranged inside a proton, to make it uniquely stable; nor is there a reason offered as to why those particles not predicted by the formula should exist. However the answer to both questions, is probably closely related, since the reason for the unique stability of the proton, presumably also accounts for the cluster of unstable particles of very similar mass. For all the figures above to have fitted together so well, is surely unlikely to be a coincidence. If I was to try to quantify the probability, I could easily come up with a figure of one in several thousand. But that would be a bit pointless, as humans always believe what they want to believe; and if they are not interested in a new idea, then they just are not.